Here's a little story about how our Mouse & Cheese range came about! 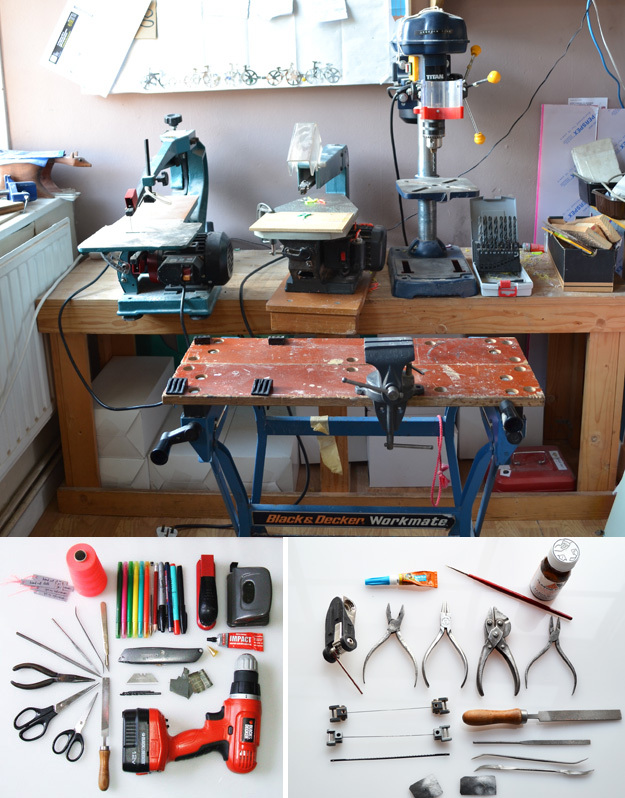 Firstly can you introduce us to your work space, what are you surrounded by when you start a project? Our work space is full of stuff! 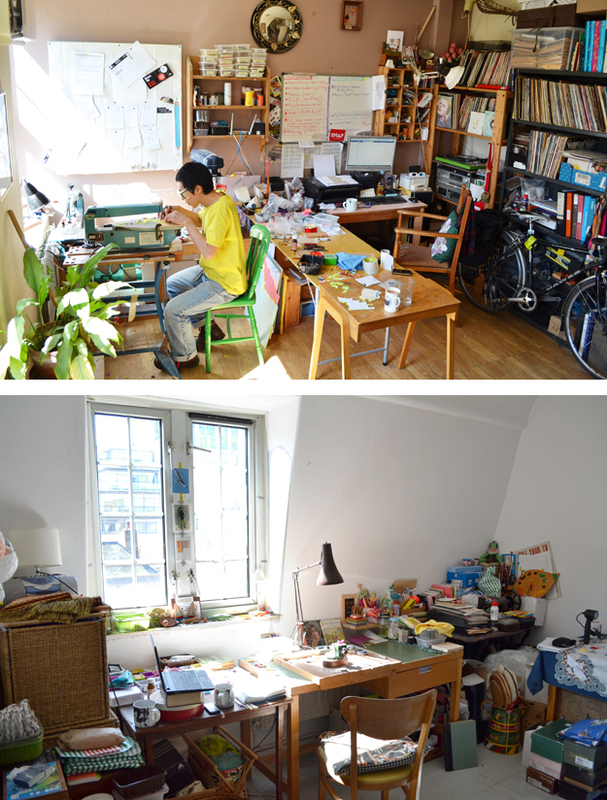 We're both hoarders (eg. Ruth has an extensive collection of 80's drinks cans and Brendan has the Now albums nos. 1-16 on vinyl) - so there's not a lot of wall or floor space that is blank. It can also get a bit tricky working on new designs because Brendan loves being messy and unorganised! There never seems to be a clear surface available or any sketchbooks to hand so initial sketches are usually made on the back of envelopes retrieved from the recycling bin! Not all projects are conceived in the work space though - Ruth quite often spends quiet time on the market stall scribbling new ideas and Brendan has plenty of time to think when he's on his early morning run around the city. So, do you remember where and how the idea came about? 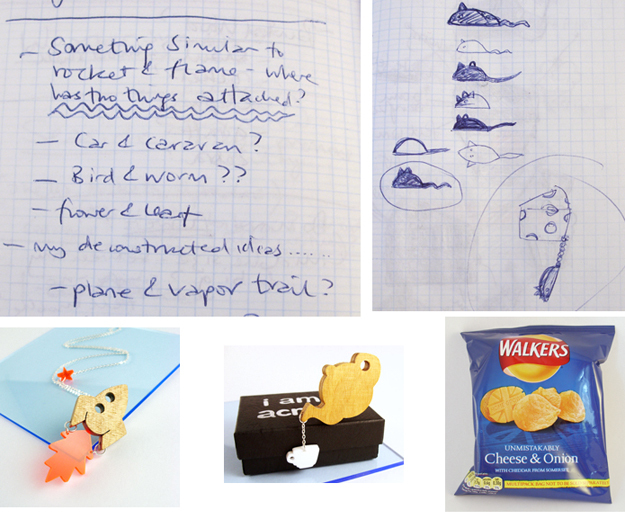 We had realised that our 'Rocket & Flame' necklace and our 'Teapot & Cup' brooch were popular - so we were trying to brainstorm ideas for something similar - that had two elements. 'Cheese & Onion' and other crisp flavours came up in the conversation - but who would want to wear an onion we thought!? 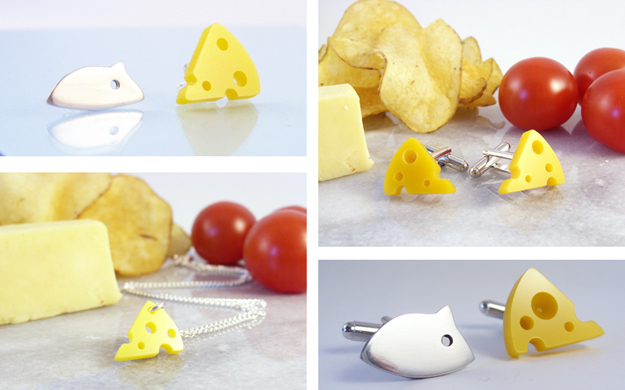 On the other hand, who wouldn't want to wear a piece of cheese? So.....starting with the Cheese - we ended up pairing it with a Mouse - naturally! Can you give a brief description of how you started the project? What was the first thing you did to get the project in motion? What are the essential tools for this project? The tools needed to make the cheese are the same as for all the other acrylic designs we do. 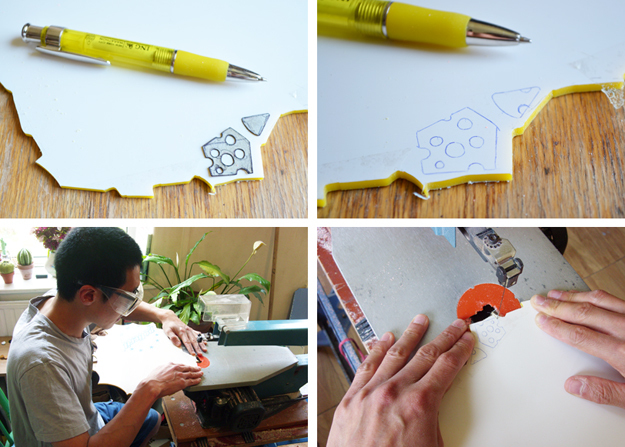 Once we've drawn out the shapes on a sheet of acrylic, Brendan uses our mechanical fretsaw to cut it out. Next we use our needle files to file the edges, a Stanley blade to scrape the edges smooth and then wet and dry paper (used dry) to give it a final buff. Then the pillar drill to drill all the cheese holes and a scalpel blade to take off any burrs on the drilled holes. Then pliers, chain and jump rings to piece it all together. Can you take us through the stages of development from start to finish? It's always fun having a new design - and the more we make something, the more it develops. The position of the holes and the shape of the mouse have changed over time. Initially the cheese had a line scratched into it to try and make it seem more 3D - but customer feedback meant that we ended up getting rid of the line all together! Within the whole process of the project what stages did you look forward too? The aluminium work was fun, it was something new to us and when we managed to get it to work, it was very exciting! 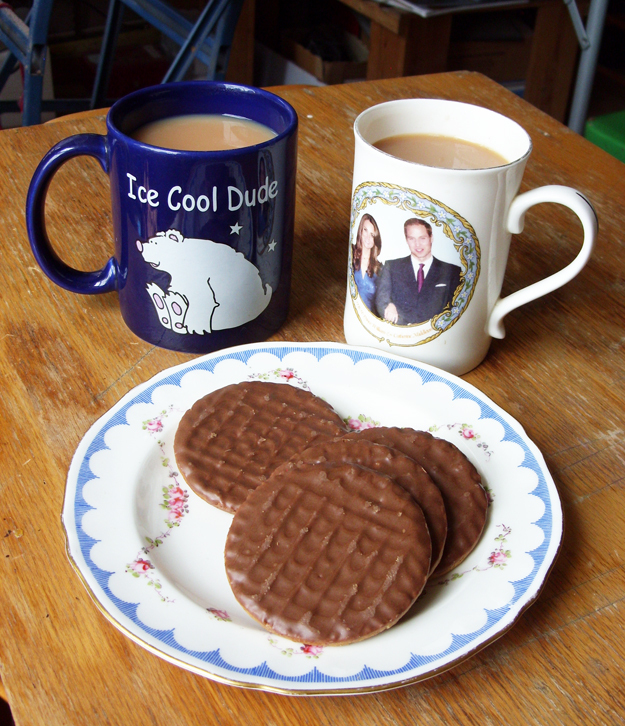 Oh, and of course, tea breaks are an essential part of any project - and the most enjoyable! Were there any stages you found particularly challenging? Actually the aluminium work was also the most challenging. 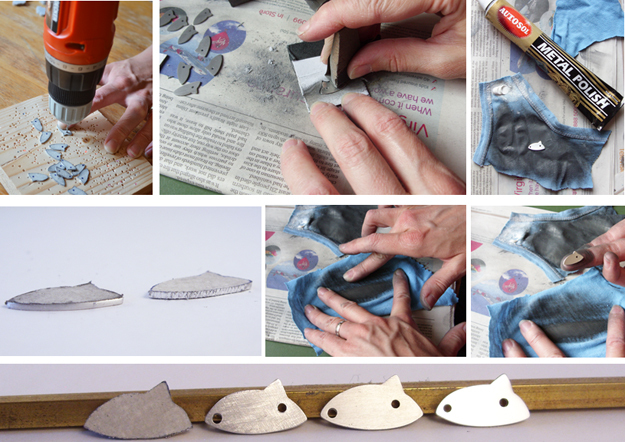 We were struggling initially to buff the mice up using Brasso and the hand drill with a little buffing pad attached - really difficult to hold especially when it got really hot from the friction of buffing! Luckily, Ruth's Dad is a retired CDT teacher, so on a visit to his house, Ruth got a master class in sanding and buffing metal! 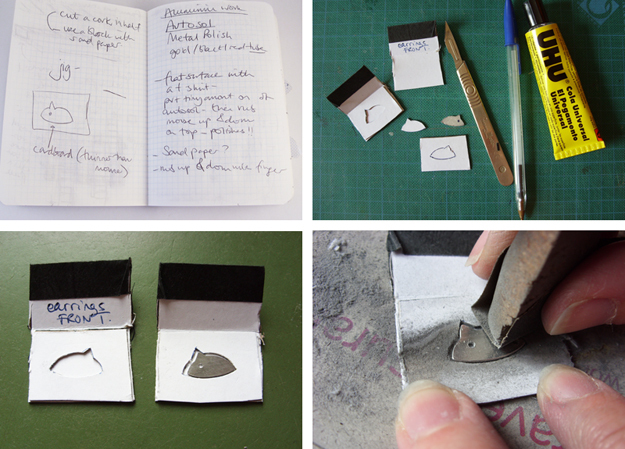 Including making a card template to hold the little mouse in place whilst buffing with wet and dry and just using your finger to rub with Autosol on a t-shirt - It was a revelation and changed her life! Are there any future plans in the pipeline for new designs? Can you tell us about them? We have already developed the Mouse & Cheese Necklace design to make Mouse & Cheese Earrings and most recently Cheese Cufflinks and Mouse & Cheese Cufflinks. 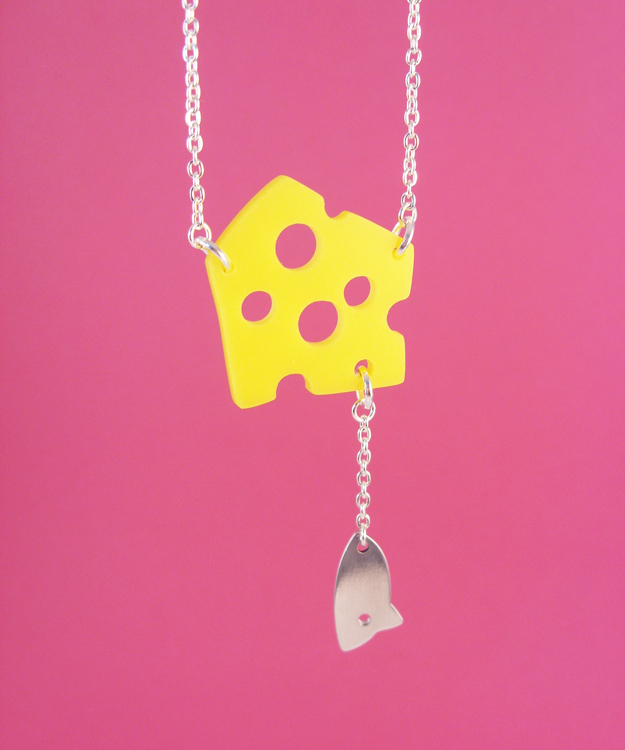 We've also made an entire Cheese Board necklace for the really serious cheese lovers! Finally, once the project is complete and you have time to yourself what the first thing you do to celebrate?